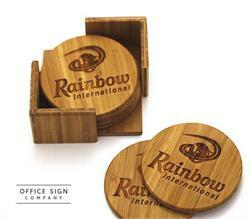 Customize these stylish laser engraved coasters with any name, message or company logo. Coasters measure approximately 4" in diameter (0.125" thickness) and are made from natural slate. Felt feet are included on the back to help prevent scratching of surfaces. Purchase a set of (6) personalized coasters or a pack of (3) individual coasters. Free text, names or logos. No setup charges. Hand made, American made product in beautiful Fargo, ND.